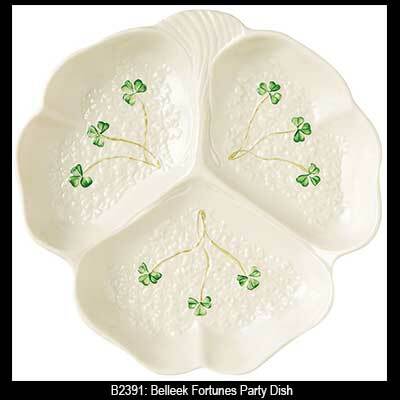 The fortunes party dish from Belleek China features a sprig of shamrocks in each section. The Belleek fortunes party dish features three sections with hand painted green shamrocks and measures 9 1/2 x 9 1/2”. This Belleek dish is hand crafted in Belleek, Ireland and is gift boxed with the shamrock history.